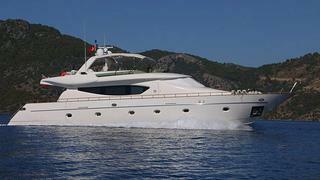 A call to Fraser Yachts brings news that David Legrand has signed the 27.75m flybridge motor yacht Oyster for sale. Built by Peri Yachts in 2005, Oyster sleeps eight guests in four staterooms and three crew in two cabins while twin 1100hp MAN engines give her a cruising speed of 23 knots. Lying in Gocek, Turkey, Oyster is asking €1.8 million.